Opponents and supporters of the Skowhegan Indians name sat on either side of the room. 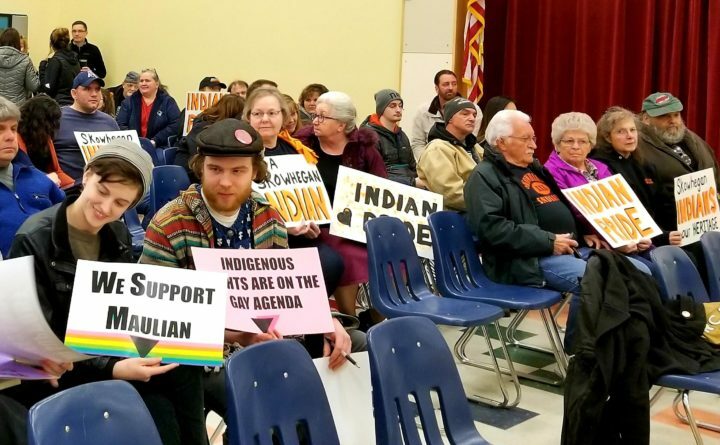 After years of contentious debate and almost 100 years of tradition, Skowhegan High School will no longer be allowed to use the name “Indians. The decision was made Thursday night at a special meeting of the SAD 54 School Board. “I think it’s a wonderful thing,” Leonard Rose, who identifies as Narragansett, said. Rose traveled five hours from Massachusetts to attend the meeting in Skowhegan. The controversy over schools using Native American imagery he says, isn’t just an isolated “local” issue. Rather, he says it’s a civil rights issue that has caused harm to native people for too many years. But not everyone is happy with the change, and not all native people are of the same opinion, cautions Kathy LeBrun, who attended Skowhegan High School. LeBrun says losing the name is another step toward forgetting the town’s first people. “Yeah, where is it going to stop?” agrees Bobbi Savage. “It’s just a shame to just pick away piece by piece by piece of the heritage of this town.” says Savage. “Yeah. I’m waiting for them to change Norridgewock’s name and Skowhegan’s name,” adds Noreen LeBrun, shaking her head. “This mascot meant a lot to a lot of people for a very long time.” says Iver Lofving, who teaches art at Skowhegan High School. But he says he welcomes the change, and sees a chance for the town and students to work together on creating a new symbol, character, and an actual mascot for the sidelines, something Skowhegan hasn’t had for years. “It’ll take a while, but I think pretty quickly people will come together and have a fun time with this,” Lofving said. Meanwhile, the ACLU of Maine is applauding the decision, and says with the change, Maine is poised to become the first state in the nation where all of its schools have stopped using Native American mascots and imagery, a practice which the group says is damaging and demeaning to native people.